The saltwater recreational fishing industry in Coastal Mississippi generates a sizable economic impact to the state. In 1996, there were more than 121,000 resident and nonresident saltwater anglers in Mississippi who spent more than $155 million on recreational fishing. These expenditures created combined output effects over $293 million, generated 3,988 jobs and $72 million labor earnings. About four percent of these expenditures incurred by saltwater anglers were spent on bait. In the Gulf of Mexico states, it was reported that during winter months the supply of live bait was not sufficient to meet the demand for them by recreational fishermen. Farm production of live bait using native fish and shrimp species will allow longer growing season and provide sources of stocks to enhance natural populations. Primary species include the Ohio shrimp and bull minnow. 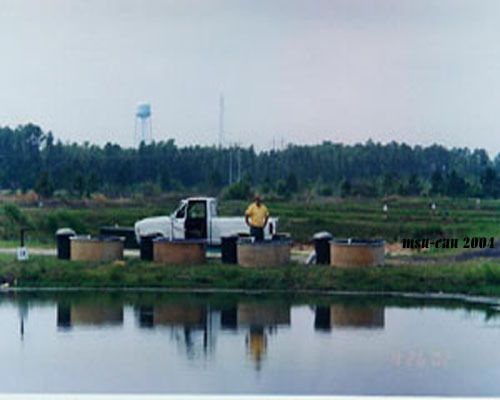 Design, build and operate a small scale tank-pond production system. Monitor critical technical and biological parameters of the entire production system. 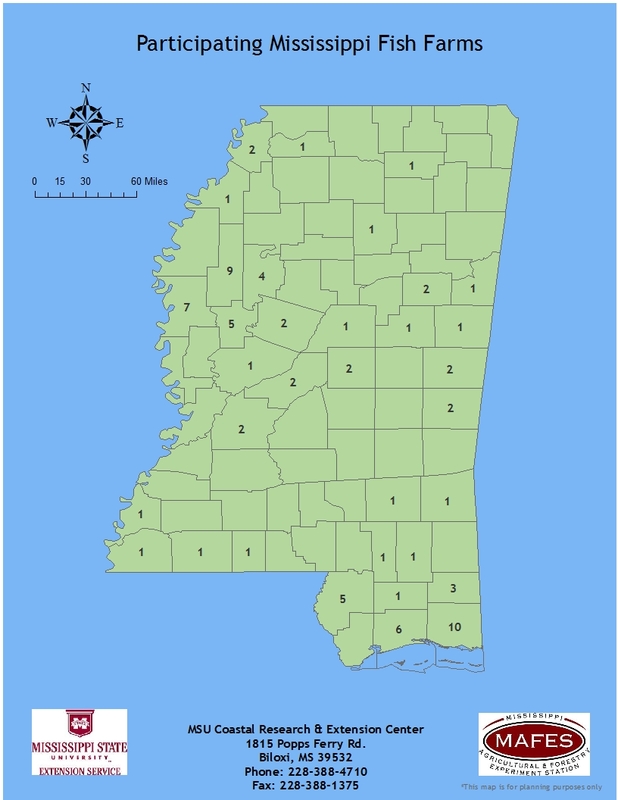 Survey live bait markets in Coastal Mississippi during winter months. Evaluate survival, growth and yield in ponds under different management systems. 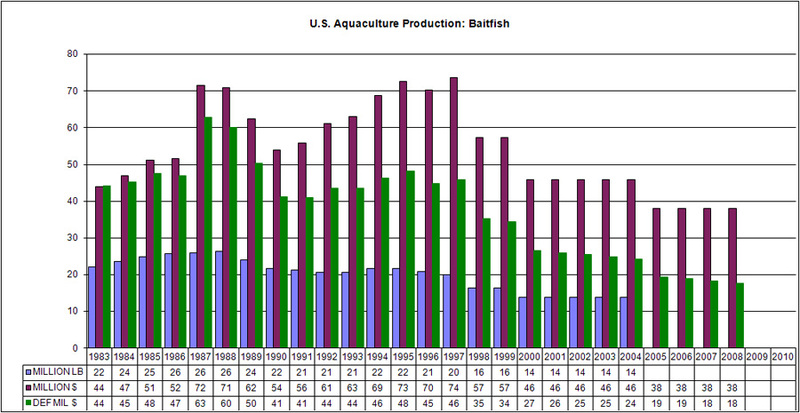 Estimate costs of production of live bait using different management systems. Provide information and technology transfer to the live bait industry. Three 0.25-acre earthen ponds were used in the production of bull minnow eggs/fry. The ponds were filled with water from the discharge canal of a nearby power plant. Broodstock were harvested locally from the wild. Females averaged 4.3 grams each and males averaged 4.7 grams each. They were stocked at the density of 10,000/acre. The female to male ratio was 2:1 respectively. The salinity in the ponds at stocking was measured at 3.0 ppt. The bull minnows were fed a commercially available 45.0 % protein crumble sized catfish fingerling diet at a ration of 3.0 % total body weight per day. Plastic air conditioner filter material (10" x 15" x 1") served as spawning mats. The mats were weighted on one end and a float was attached to the other so that they would be suspended vertically in the water column. The mats were placed along the entire shoreline of each pond when the water temperature stabilized between 13 oC and 24 oC. Twenty mats were used per pond. The mats were removed from all three ponds after 7 days and separately placed into three 200 gallon circular fiberglass tanks. The three tanks were set up as a flow through system. The water was collected from a neighboring pond with a measured salinity of 3.0 ppt. After two weeks in the tanks the mats were removed. The fry were allowed to grow for an additional period of one week. The tanks were subsequently drained and the fry counted. An experiment was conducted to evaluate bull minnow egg and fry production at low level salinities. The salinities evaluated were 0, 3, 6 and 9 ppt. All tanks were filled with water from the on-site freshwater well. The salinities were adjusted with a mixture of synthetic sea-salts. The salinities were checked and adjusted at least once a week with synthetic sea salts or well water. Four 200-gallon circular fiberglass tanks were separately maintained as recirculating systems. Each tank was maintained at different salinities. A 20-gallon glass aquarium (36" X 12" X 16") was placed into each fiberglass tank to shelter the fry from the broodstock. Each aquaria was fitted with a 3/4-in screened (1000 micron) side drain near the bottom. A bio-filter was utilized to help remove organic material from each system. The bio-filter was constructed from a 30-gal plastic garbage container. It was 1/3 filled with oyster shell and a circular piece of air conditioning filter material was placed on top of the shells. The water was pumped from the bottom of the fiberglass tank into the bottom of the filter. The water was returned to the top of the glass aquaria and fiberglass tank via gravity. Broodstock were harvested locally from the wild. Females averaged 8.0 g each and males averaged 7.4 g each. Each tank received a total of 27 bull minnows. The female to male ratio was 2:1. The bull minnows were fed a commercially available 45% protein floating pellet (3/32") diet at a ration of 3.0% total body weight once per day. Plastic air conditioner filter material (10" x 7" x 1") served as spawning mats. The mats were weighted on one end and a float was attached to the other so that they would be suspended vertically in the water column. A total of 10 mats were used per tank. The mats were removed from all four tanks after 7 days and placed into the glass aquaria. Two of the ten mats from each salinity trial were sampled at the end of the seven day period. They were soaked in an organic dye solution to color the eggs. The eggs were then counted and the numbers recorded. The 8 mats placed into the aquaria were left for a period of two weeks for hatching. The mats were then removed from the aquaria. The fry were left in each aquaria for an additional one week growth period. The fry were then counted and released into a holding pond.